Before leaving La Paz a few weeks ago I met with the owner of Casa Parra to show my artwork. 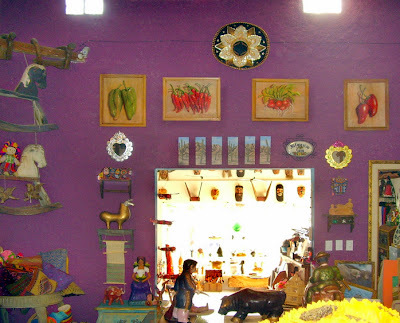 Claudia offers beautiful handcrafts and art for sale at very good prices. I left a few paintings with her. 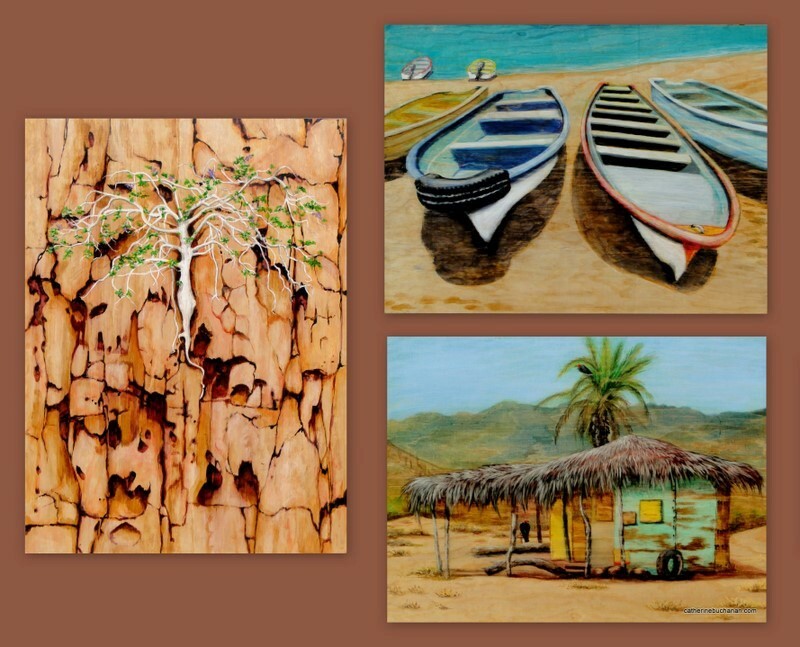 Some dye on wood, others oil on canvas, inspired by my time in Mexico. Look for the gallery/shop on Madero, between Idependencia and 16 de Septiembre. Casa Parra is in the old section of town where the sidewalks are as creative as the handcrafts. Long ago roads built at odd angles may have been a military strategy that prevented cannon balls from traveling too far into town, but I doubt La Paz was that well planned. It appears to have grown organically, like a tenacious weed in a hostile environment. La Paz sits on the fence for now. Resorts are slowly appearing and golf courses fringe the outskirts of town. Bright patches of manicured lawn creep across the desert like giant green amoebas. A warning that rustic charm could be swallowed whole, overrun by expensive package resorts and wet T-shirt contests like Cabo San Lucas. Downtown La Paz is a little gritty and well used. People are friendly. Walking around involves alternating between returning greetings and keeping your eyes on your feet. Escher would have found the sidewalks inspirational. Sections of old walls peek through crumbling modern facades, as if vandals had the foresight to arrange an architectural treasure hunt. It rained for thirty seven seconds, just long enough to make the sidewalks billow with steam. People ran into the street to celebrate. It was the most rain the city had seen in well over a year. During summer the city feels like a sauna and cars, well they could be microwave ovens. It’s a great time to visit if you like it hot. The beaches aren’t crowded and rooms without air conditioning are definitely not taken. I'm currently on the Northern California coast in the cold, dense fog wearing a sweater and a parka, clearly longing for a hot, dry place. 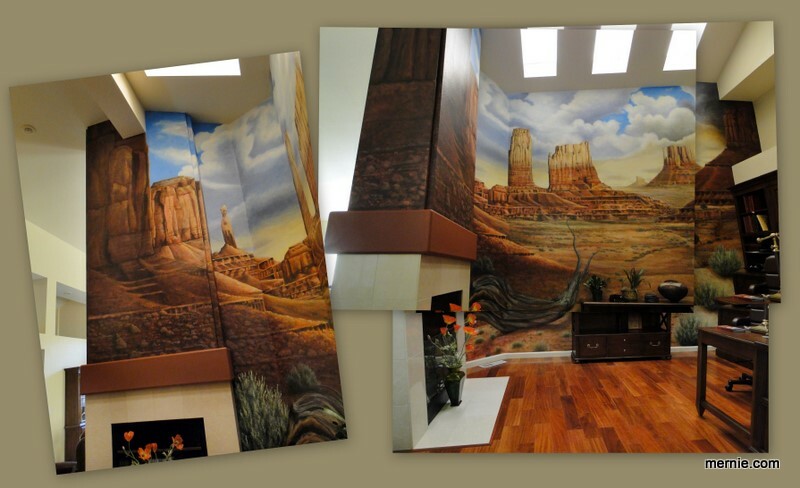 My sister painted a mural in a private home in California and the owner recently threw a party to show off the results. I’d seen progress shots and knew her back was hurting from climbing up and down the scaffolding. But I forgot about the difficulties of doing a large scale work in a small space when I saw her beautiful mural. No wonder the guy threw a party, it should be on a public tour. I enjoyed watching the guests react. Rounding a corner in the large, rambling home smack into Monument Valley was unexpected and her painting inspired big arm gestures and loud exclamations. The mural turned an odd shaped home office with a cathedral ceiling into a natural wonder. It must be experienced though, as it was nearly impossible to photograph. Way to go Mernie, it’s your best yet! More of my sister’s work can be seen at mernie.com. "Remember running to the bar with the French guy during the hurricane? We had such great times." This was a recent message from my former roommate. For a fun filled year we shared a house in the jungle on a steep hillside in American Samoa. I think he said it was his first time out of Arkansas, but I might not have remembered that right. His first day on the island we walked down the road from the house to catch the bus as neither of us owned a car. I’ll never forget the perplexed look on his face when he realized that Samoans bury their dead in the yard, usually within tripping distance of the front door. I wrote about running to the bar in the storm for a book I’ve been writing. I might finish it someday, but the night he mentioned is worth repeating. During summer near the equator the midday sun was so intense I wondered if there even was an ozone layer. The clouds staged a weather marathon, pounding the island with rain so hard it seemed vicious. American Samoa redefined tropical from downright hot to nuclear meltdown. Merciless, scorching pavement burned through the soles of shoes on an average day. 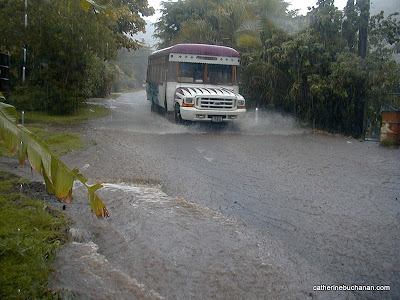 The road quickly became a steamy, raging river minutes after a downpour began. The house stood between two mountains that funneled the rain down the road as if a damn burst. Due to incomprehensible laziness and a total lack of engineering foresight the road had been built on the riverbed. Jonathan and I test drove several outrageously overpriced cars that coughed and sputtered up the first incline. We should have bought inner tubes to ride the river downhill and given up looking for a car. He eventually bought a jeep with countless issues from a couple who left the island knowing they got the better end of the deal. For the month it ran we cruised up and down the island looking for things to do. One evening he invited two sailors he had recently met to go dancing and we picked them up at their boat in the harbor. A night out with three handsome guys made me feel like a golden retriever going for a first car ride. Of course it started raining, normally at first until the wind picked up and buckets of rain swamped the windshield wipers. We turned down a long dark, rutted road hemmed in by jungle looking for the beach bar with a live band. Luck was not with us. With a loud thud the bottom of the jeep fell off. The drive shaft bounced down the road end over end and disappeared into the dense foliage. We rolled to a stop on the side of the road, which actually was lucky since the jeep no longer had any power or much steering. I assumed our fun night had crashed to a halt, but I underestimated my companions. They still wanted to go dancing. My roommate realized he had been royally screwed and still owed a lot of money for a piece of junk. We left the jeep for the pilferers on the side of the road and hitched a ride in a pickup truck. They dropped us off a little closer to the bar, but still several miles away. Suggesting we run the rest of the way they stripped their shirts off in the deluge and we took off at an even pace, but I soon lagged behind. I watched the guys up ahead moving gracefully through the howling storm. They passed in front of a store through the glow of an eerie neon light that cast rainbows across the wet pavement. The porch in front of the store hosted the usual cast of men from the village drinking quarts of beer. They sat with legs outstretched and their backs on the wall under the eave. Kids chased each other around the parking lot fueled by candy and soda. I heard laughter from the men on the crowded stoop as three shirtless white guys dashed by on the road in front of them. I'm not sure why that was funny, although Samoans often found foreigners amusing. I had no choice but to slog along, realizing I would appear even sillier. The laughter turned from joyous cackling to raucous, knee slapping hooting when I came into view. I could see it from their perspective. Three hot, half naked young guys bolting down the road with a drenched, middle aged woman panting along behind them. We made it to the funky bar under a thatched roof, where our chairs sank into the wet sand floor. The dance floor was under a different pavilion so we dashed back and forth in the rain, shaking the water out of our hair like happy wet animals. The owner of Sadie’s Hotels in Pago Pago asked if I could put a calendar together of my paintings with advertising on the back to promote tourism, the hotels and my artwork. What a great idea, I thought, but I am short Illustrator skills and long on delusions about how many minutes are in a day. Although parts of my brain would have to cease functioning before I’d bore anyone with computer glitch details, I’m glad to say it’s at the printers and I'll post pictures soon. How is it computers have taken over so much time? I think it was faster back in the day to drive to the copy shop and paste things up with glue and scissors. Even painting seems so old fashioned, but I’ll stick with that dinosaur skill until computers automatically reproduce what is in my mind, with paint. Or maybe I don’t want to know what would come out of my brain. After a week of crashes and insufficient memory space messages a laptop going up in flames on reentry through the atmosphere might come out and then I would have to burn that. I’d post a picture, but there is insufficient memory and I’m not sure at this point if it’s mine or the computer's. My friend Heidi’s home qualifies. Three blonde dogs romp in the yard and lounge around the house. Templeton is a small town in the central coast area of California surrounded by vineyards and golden rolling hills dotted with gigantic oaks. I almost forgot places like this existed and it still doesn’t seem quite real. Truthfully, I would love to be one of their dogs. If they were looking to adopt an adult artist I would stand in line. Heidi introduced me to Dr. Stephanie Szabo who owns and operates the Chiropractic Care and Swim Therapy Center for dogs. Dr. Szabo is a chiropractor trained to work on both people and animals. Her ranch is also in Templeton and I’ve spent a few afternoons photographing sessions with dogs that were being rehabilitated. It's fascinating, not just watching the dogs and people, but observing the care Dr. Szabo shows for animals. She coaxed a frightened Rottweiler into the pool and gained the trust of a tiny Dachshund that hated getting her ears wet into swimming laps like a motorboat. Clearly the people who show up with their pets have an unsurpassed love for dogs. And the dogs showed concern for each other standing on the edge of the pool wiggling and whining while one of their own swam in the pool. My paintings are on display in the building that houses the pools. They are painted with the finest quality acrylics and sealed with a bullet proof UV coating. They have withstood children’s fingernails in airports, spaghetti stuck to them in restaurants and now wet dogs having a shake. I enjoy showing my paintings in places where they are most appreciated, no matter what. The center also maintains a herd of sheep for training herd dogs, but most of the time the sheep are lucky enough to stand quietly in the shade. The grounds are beautiful and it's no wonder the business is doing well. It feels good to be there. I tagged along with Heidi and her dog Gypsy a few months ago to see what swim therapy for dogs was all about. 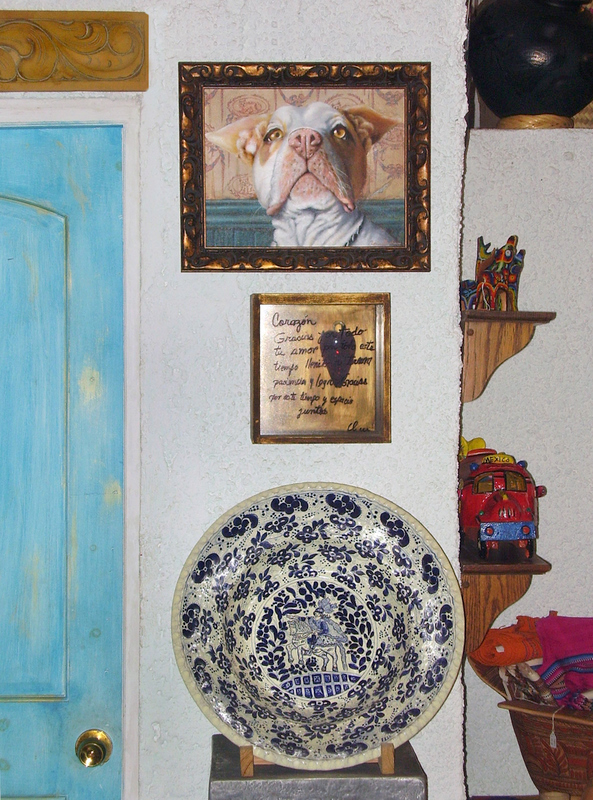 I must remember to thank her again for introducing me to people who are happy to display my paintings. Dr. Stephanie Szabo is a chiropractor with training in both human and animal chiropractic care. She is a 1992 graduate of Palmer College of Chiropractic, West and has completed the chiropractic Options for Animals program through the American Veterinarian and Chiropractor Association. She also completed the advanced three year Animal Chiropractic Diplomate Program. She brings her extensive background and experience to the swim therapy program. You know you’ve had a great day when you’re tired, sunburned, coated in fish slime and still grinning. Last week my agent wrote and asked me to come up with paintings for a fish restaurant. The next next day I was invited to go fishing on a friend’s boat. Who would believe it? Who would say no? Fishermen leave at the crack of dawn, which strikes me as malfunctioning DNA over anything to do with fish habits, but I’ll always get up and go. It’s an excuse to be on a boat for a day, whether or not the fish bite since the ocean is the finest place to be, ever. That is part of my DNA. We launched the boat and motored out of Morro Bay to the fishing grounds where boats were anchored anywhere people thought there were fish. Plenty of sports fishermen had gotten out of bed long before we had and were hunkered on their boat seats in lumpy down jackets with lines in the water waiting patiently for fish to bite. Fishing doesn’t actually look fun. Woody switched on the fish finder and clouds of green things flashed on the screen. Squid apparently, schooling in huge numbers, like billions of them and at least a million right under the boat. Larger fish hang out on the edges of the ball of squid to feed on them as if they are candy and not a raw squishy thing filled with vile black ink. Since I don’t get to go fishing very often and rarely go with someone who knows what they’re doing I didn’t understand why Woody handed me a pole and told me to catch as many squid as possible. I don't ask enough questions. There is something to going through life without clarity until the answers just smack you in the face, but I don’t recommend it. I finally caught a few squid after many lame, useless attempts. Woody was reeling in squid three and four at a time and throwing them a live bait tank. Not catching squid turned out to be more fun. The crafty devils shoot a jet of cold water and indigo ink in your eyes, nearly without fail. I worked it out though, we weren’t fishing yet, just catching live bait. They were cute, like pets, so I stuck my underwater camera in the tank for pictures just in case I ever wanted to paint a squid portrait. Several boats over someone screamed like a girl. I’ve heard that exact high octave hollering before and it usually means a monster fish is on the line. When guys scream in pain they still sound more or less like men, but hooking big fish clearly puts them in touch with their feminine side. It was a forty one pound sea bass, exactly what everyone on every other boat sitting in the fog since before dawn wanted. The guys in skiffs who were not catching anything lowered their heads in renewed prayer or abject envy, I couldn’t tell which. I had to man up to put a live squid on a hook. Of course it's much easier to buy frozen fish fillets and never kill a fish, but I eat meat so I looked the squid in the eye and appologized. I wasn't brave enough to say it out loud though. We caught a few mackerel for the bait tank, but I'm glad Woody threw the baby sea bass back. Then we did what everyone else was doing. Dropping lines in the water and waiting. I watched the seals play, the light sparkling on the wave tops and enjoyed the gently rocking boat with zero adrenalin to muddle random thoughts. But Woody actually knows how to catch fish. He moved the boat and changed the strategy. He quickly showed me how to tie a knot with seven loops and five twists, explaining how easy it was. Right, like speed reading quantum physics. Hope I’m never tested. Bouncing weights off the bottom with live squid on a hook had us a screaming like girls in no time. We caught one fish after another and couldn't reel them in fast enough. Mostly rock fish and several Ling cod. A few unhooked themselves and got away, which was only fair. Then Woody caught a good sized halibut and I tried to gaff it while he begged me not to miss. I held the fish up for a photo Christening my jacket with fish snot. Halibut skin is slimier than a bucket of banana slugs. Then I caught a shark and was all for cutting the line and letting the hook go, but that's not what happened. Woody got it on board and I took pictures while the shark wound itself up in all the gear and twisted around the rod. I should have been helping, but I was still thinking about the restaurant commission over doing the right thing for a guy with shark problems. I'm still a little sorry about that, but he did get the hook out of the shark and let it go. I quit taking pictures or I might have had to swim home. The fish were all eaten by Woody's family and neighbors. Deep fried in Heidi's beer batter cardboard would taste great, but the fish was mighty fine. We ate like deprived pelicans and lay around moaning. I flew to Los Angeles last week and helped my friends move out of their house. After Mexico, the contrast brought on another bout of cultural disparity. The food is better, people are friendlier and houses are built to last, in Mexico that is. La Paz doesn't have level sidewalks or water pressure every day, but family is fiercely important and kids play outside. The house in Los Angeles had been beautifully remodeled over the years, but there were a few things to fix to before closing the sale. Home inspectors have the last say; they rat out every missing screw and file reams of reports that can easily queer a deal. I'd like to read a report that profiles the psychological attributes of home inspectors. Who are these guys? And who really cares about 30 out of 40 things on their lists? Dirt on a vent? A sagging hose under a sink? Please, hoses sag and they don’t set houses on fire. The plumbing where I stayed in Mexico was propped up with high heel shoes and sure the pipes leaked, but someone tied pieces of plastic around them kept water from spraying everywhere. I'd like to send all the home inspectors in LA on vacation in Mexico and stand by while they implode. Can you see their reports? Large gas cylinder improperly chained to roof, bare electrical wires running down kitchen wall, previously stolen copper pipes inappropriately replaced with exposed PVC, ladies footwear and trash bags. My friend's stove in LA needed to have one small part replaced, which was one of the five things that made a little sense. The burner didn’t light. The report did not recommend buying a box of matches like ninety percent of the world’s population would know how to do. The repair did not look like a big problem, in the mind of an eternal optimist anyway. Only our products aren't American anymore, they all come from somewhere else. We buy them and throw them away like fast food wrappers when they quit working and that's our fault. New lust, America doesn't do rustic when it comes to appliances. Things absolutely must look bright and shiny, but why we have sacrificed function for style I'll never know. Sadly, the effect of an electrical spark traveling through the cast aluminum burner and cheap metal screws welded them together. No problem, I used to work in boat yards where I earned the nickname “the screw queen” for my patience with backing corroded screws out of holes. I tapped, scraped, drilled and used vice grips on those damn screws for hours to no avail. Finally I leaned on one, to give it a brutal turn, and watched with horror as a crack ran across the glass top. My dear friend Karen never even got angry, not even annoyed. I felt like projectile vomiting on rusty screws everywhere. To make a much longer story mercifully short, we ordered the part and got the thing fixed, with a little help from a former race car mechanic and installation expertise from an appliance repair guy who said he would have looked at the rusted screws and recommended a whole new stove. The problem could have been prevented with stainless steel screws, but that have would add a few dollars to the manufacturing cost. The cost of the labor to remove the fused screws would have sent the stove to the recycle yard. We want cheap stuff and guess what, that’s what we get. Two thousand dollar stoves that are junk in less than five years, water heaters that melt inside after a year and home inspectors to point it all out. I’ll take a cinder block house and a cast iron propane burner any day. Cooking in the backyard in Samoa with hot rocks was pretty good too.